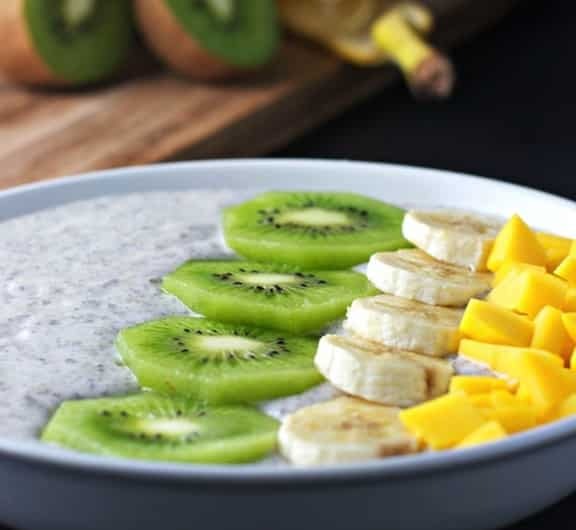 This breakfast bowl featuring chia seeds is just as easy as to make as pouring a bowl of cereal, more nutritious and tastes even better! It takes two minutes to mix all the ingredients together, place in an air-tight container and refrigerate overnight. Wake up and breakfast is ready. You can also portion out into smaller containers for a great grab and go breakfast on the run. Packed with nutrition, each serving contains 4564 mgs Omega 3 fatty acids; and 1504 mgs Omega 6. 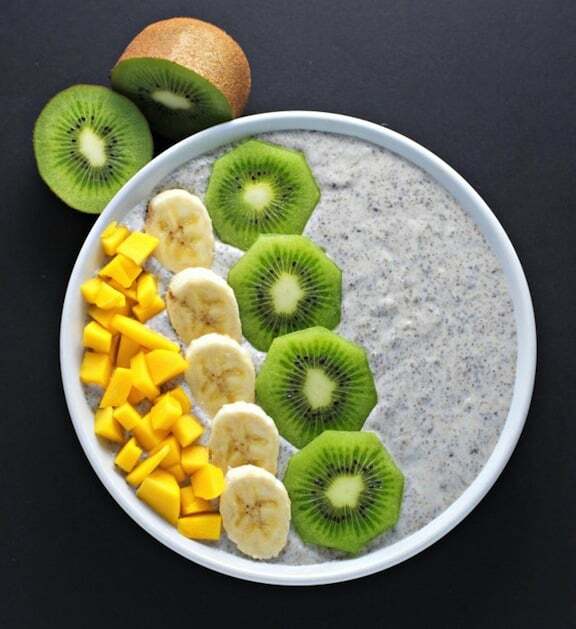 You also get 10 grams of fiber; 12% daily value of calcium from the chia seeds alone, and 10 to 15 grams of protein depending on the type of milk you use. Talk about a power breakfast — and you get even more benefits by adding fresh fruit. Recipe and photos contributed by Christina Cavanaugh of Begin Within Nutrition. 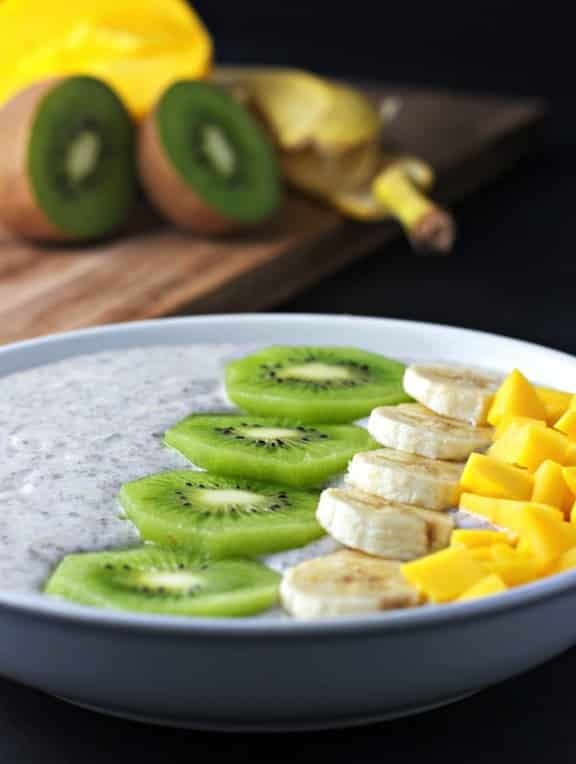 Combine the chia seeds, nondairy milk, syrup, and vanilla extract in a bowl and stir together. Let stand for about a half hour, then whisk together to prevent the seeds from clumping. Transfer to an air-tight container, cover and refrigerate overnight. In the morning, divide between two bowls, and serve with toppings of your choice. Learn more about chia seeds. Per Serving: 298 calories; 35g carbs; 15g fat; 14g protein; 107mg sodium; 19g sugar. Mark, personally, I think this would be best with almond milk, but use your favorite non-dairy milk. The calorie count is 250 to 300 per serving, depending on the type of nondairy milk used. Cool! Let us know what you think! The recipe doesn’t say, but are the chia seeds chopped, ground, or just used whole? Just used whole — thanks, I’ll clarify! I’m so loving your posts. Can’t wait to share and try this one. Thank you for helping us on a healthy journey. Thanks so much, Vashti. So glad to be on this journey with you! I feel like an idiot, but put this together last night and just opened it up this a.m. It is completely liquid. I know there isn’t a thickener in it, but I guess I thought the seeds might do something to thicken it. Help! It looked so good! Mary, you shouldn’t feel like an idiot, that’s for sure! I’m not sure what might have gone wrong. Let me get the recipe’s author to weigh in. Im an 11 year-old vegan and have been searching for some easy yet healthy breakfast ideas (Im excited to try that tofu scramble). This looks absolutely perfect,yum! I was wondering though, where might i find chia seeds? Also, you mentioned almond milk is especially good in this recipe. Im not fond of almond milk and i drink rice milk. Would that be ok in the recipe? Hi Emilie — how great that you’re taking matters into your own hands when it comes to your healthy meals! You can get chia seeds at most natural foods stores, as well as online. Just google “chia seeds” and it’s likely to lead you to some sources. Rice milk would be fine. Please come back for more recipes and ideas; you sound very well spoken for your age! Can I also make this without the syrup? Sure, Marloes; use another sweetener, or none at all, it should be to your taste! this was great, thank you! already made it twice..w/ unsweetened almond milk…only 30 calories a cup! So glad you enjoyed this, Jo Ann. I like putting chia seeds on my oatmeal cereal. Should they be ground first for the best benefit? Robert, unlike other seeds, chia need not be ground. You can if you’d like; it’s just a matter of personal preference. I add 2 Tblsp Chia seeds to 1 Cup almond or Coconut milk, 1/8 tsp. of cardamon spice and 1/8 tsp cinnamon,add maple syrup to sweeten qand a few chopped walnuts!!! shake well and put in refrigerator for 30 min! Do you eat it cold or heat it up? It looks like cream of wheat, I eat hemp seeds on salad and oat meal and chia on salad and greek yogurt and ground flax on oatmeal and all kinds of things for all seeds, but never made anything like this overnight…thanks in advance. If you eat too many as we have ONLY ONCE you get such a belly ache as they expand….. haha So 1/2 cup sound like a lot to me…. any issues like that?